Toronto's leading scorer Phil Kessel left practice early Wendesday and was heard to be cussing as he entered the dressing room. Coach Randy Carlyle confirmed later that Kessel "didn't feel well in one area of his body." Exactly who will be in the lineup Thursday night when the Toronto Maple Leafs host the Dallas Stars remains a mystery. David Bolland won't be, that's for sure. He's been out for a while with a cut ankle tendon. Chances are left-winger Joffrey Lupul won't play. He has a groin injury, and although he skated with his teammates Wednesday for the first time since going down, Lupul cut his practice short and didn't seem too pleased when he headed to the dressing room. "I'm done," he spat, shaking his head as he left the ice. Odds are centre Tyler Bozak will miss the game. He was scheduled to have an MRI done on his upper-body injury after leaving halfway through Tuesday's home loss to San Jose. Unless the Maple Leafs have a sudden change of heart, it would appear centre Jarred Smithson won't see the Stars, either. He was placed on waivers Wednesday. 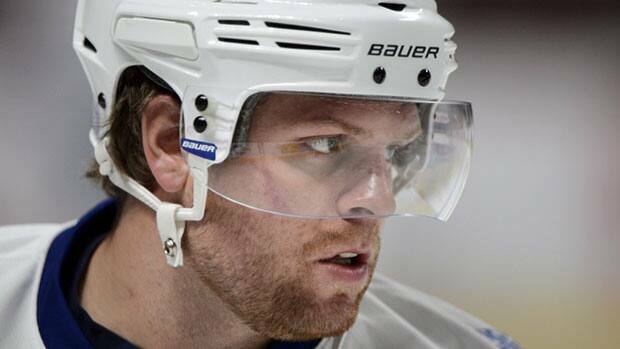 Enforcer Colton Orr also missed practice because of an inflamed elbow. Then there's the plight of right-winger Phil Kessel. He also left practice early and was heard to be cussing as he entered the dressing room. "He said that he'd had enough practice and said he didn't feel well in one area of his body so we let him go," said coach Randy Carlyle. As for Lupul, Carlyle said "I didn't see him go, but he wasn't scheduled to stay out for the whole practice." The good news is defenceman Cody Franson, who missed the past two games, practiced and looks to be ready to play. The HBO cameras were rolling at Air Canada Centre Wednesday. Two players -- James van Riemsdyk and Mark Fraser -- were fitted with microphones, as was coach Carlyle. The coach said he has not instructed his players on what they can and cannot say for the crews shooting HBO's 24/7 series. "I think our players have a responsibility to deal with the media in an open and honest form," Carlyle said, adding that playing in a mass media centre like Toronto has "hardened" and "weathered" many of his players. Carter Ashton would have no luck at all. A first-round pick of the Tampa Bay Lightning in 2009, Ashton has played 30 NHL games with the Maple Leafs over two seasons and has yet to score a goal. But when he plays with the AHL Marlies, where he had three goals and five points in four games, it's obvious he's ready for the jump to the NHL. Carlyle feels Ashton is making huge strides. "I thought he earned the right to stay with our club at training camp and when it didn't work out, he went back down [to the Marlies] and he was the best player down there," Carlyle said. "He is a dynamic player down there, a different player than he is here. That means the step is that much smaller for him to come in and make a contribution." Ashton was scratched Tuesday, but skated with centre Peter Holland and right-winger Nikolai Kulemin Wednesday. "It's a process," Ashton said. "No matter what role you are put in you have to take advantage of your opportunity. You have to find a way to find the back of the net. I keep getting more comfortable with the puck so it's going to come." Do the Maple Leafs really need to have both Orr and Frazer McLaren in the lineup at the same time every game? Some night, perhaps they do. For instance, on Sunday the Leafs will host the Boston Bruins, a team with an abundance of toughness. Having both of them in the lineup helps keep the likes of Shawn Thornton and Milan Lucic honest. But when the Leafs host a team like the Sharks, as they did Tuesday, they probably don't need two guys who ate up a combined 12:18 of ice time. McLaren played 6:21 and had three hits while Orr played 5:57 with five hits. Their line was on the ice and trapped in the defensive zone for an eternity when San Jose scored the winning goal. The Sharks have a bit of toughness in former Leaf Mike Brown and Andrew Desjardins, but they are not the type of players that will traditionally disrupt the lives of Toronto's skilled players. Having one of Orr or McLaren in the lineup, along with Carter Ashton, would probably have served the Maple Leafs better. Neither Orr nor McLaren has registered a point this season. The Leafs played approximately six minutes with both Orr and McLaren on the ice together -- that's 10 per cent of the game when the team had virtually no chance to score. It is highly debatable if both will be needed to face the Stars when Dallas comes to town Thursday.